Latest News: UK PSC re-opened the UKPSC Civil Judge Recruitment 2019 Applications. Candidates can apply now for 30 posts of Civil Judge HJS. The application link is available again to apply from 20th March 2019 to 10th April 2019. 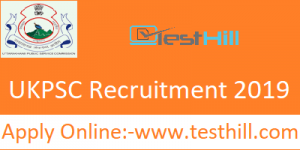 Short Info: The department (Uttarakhand Public Service Commission) UKPSC has officially notified the candidates regarding the UKPSC Recruitment 2019. This recruitment is for the Civil Judge PCS J. There is a total of 30 posts for the declared recruitment. The candidates who want to be the Civil Judge PCS J as it is one of the most reputed profiles in Uttarakhand Public Service Profile. The (Uttarakhand Public Service Commission) UKPSC has invited the candidates to fill up the declared profiles. Candidates who fulfill all eligibility criteria must apply for the same. The applications started on 28th December 2018 and going till 17th January 2019. This is a magnificent chance for all the candidates who are preparing for this recruitment and want to get hired for this designation. If you are one of them, then you are on the right webpage. Before applying for this recruitment all candidates should know about this recruitment. We have provided all the important information regarding the UKPSC Recruitment 2019. All aspirants can check the details on this article to save precious time. (Uttarakhand Public Service Commission) UKPSC applications have started on 28th December 2018. Aspirants can apply from the official website. While making the online application, they should aware for several things like eligibility criteria, educational qualification. All of this information is available on the official website. Candidates who are interested in this recruitment have to aware about the last date. They all are advised to apply before the last date i.e, 17th January 2019. Candidates should be more precise while making the online application as the correction in any application will not be tolerable. The authority is not going to accept any further application after the last deadline. (Uttarakhand Public Service Commission) UKPSC has all rights to reject any application any time in case of any doubt.